Oh hey! Just a head's up: this Sunday Stroll post comes to you via Sawyer products. Yay for sponsored posts and being outdoors! It has been SO LONG since my last Sunday Stroll post! No joke, itâ€™s been almost a year since my last Sunday Stroll post on Adams Tract in Carrboro, eek!! And while Iâ€™ve been hiking and running, thatâ€™s a fair representation of how long itâ€™s been since I went on a Sunday Stroll with my dad. Weâ€™ve only ever been on one other Sunday Stroll since then at Clemmons forest, and I just havenâ€™t posted about that. (Also my bad.) But Iâ€™d been talking a big game about reviving our Sunday Stroll tradition, and I even texted my dad to check his availability for a recent Sunday morning, only I never actually followed up with him on when or where or how far. Note to self: if you even remotely suggest a time for a hike with my dad, he will apparently show up at your doorstep. Hi, Dad! Aha! I had just the spot! Iâ€™d been to Brumley Forest a couple times now: Iâ€™d gone trail running there with Kelly for her Bryce Canyon Triangle training trail bucket list, and Iâ€™d ventured back there more recently to do a longer trail run with Jill in December on the mountain bike section. (I might have promised Jill at the time that we would do 6 miles topsâ€¦no need to carry water or nutrition on that trail runâ€¦And we might have done 9 miles instead that day. Whooooops!) (Basically this post is making it sound like you should never let me organize a hike. I promise Iâ€™m organized when it matters! Ha) Iâ€™d wanted to go back and explore Brumley at a slower pace though since itâ€™s pretty and would be a good spot for some Sunday Stroll photos. So off to Brumley we went! 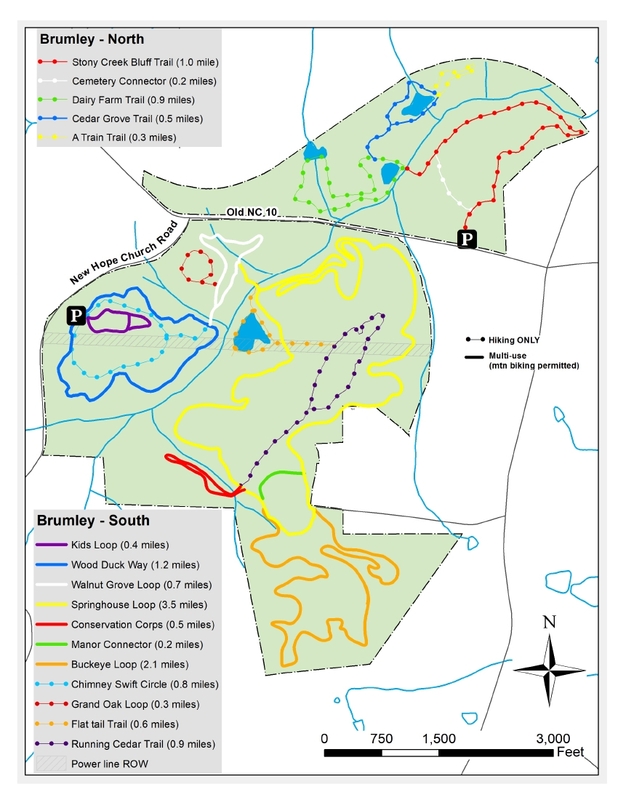 Brumley Forest is a Triangle Land Conservancy nature preserve in western Chapel Hill off New Hope Church Road. The preserve is bisected by Old NC 10 with two separate parking lots â€” one for the north section where there are only trails for hiking, and one for the south section where there are trails for hiking and mountain biking. The north section has about 3 miles of trails, while the south section has 11.2 miles of trail. Most of the trails at Brumley are loops connected to other loops, so you can generally plan a route from the parking lot and see everything without too much out and back hiking on the same trail. The preserve is a relatively new park, having opened in 2017. The land was originally farmland and was part of the Strayhorn/Craig plantation, whose manor house burned in the 1970s. The property itself was planned for development in the 1980s-1990s, but the Brumleys, who lived nearby and were passionate about conservation, purchased the property. The Brumleys used the land for forestry, farming, and hunting, but George and Julia Brumley (as well as their two children and other family) tragically died when a plane crashed into Mt. Kenya, killing everyone on board. (source and source) The land then passed to the Zeist Foundation, which subsequently sold the property to TLC in 2010. TLC created the hiking trails and mountain bike trails and in 2017 the nature preserve opened to the public. From the north parking lot, we set off on Stony Creek Bluff Trail and quickly came across the old Strayhorn graveyard with a giant tree that sprawled wildly. Here we opted to take the Cemetery Connector, which is a shortcut to the other trails, though you could just stick with Stony Creek Bluff Trail for an extra 0.6 miles through rolling pine woods. From there it opened into a meadow area and then you reach the large wooden bridge over Stony Creek. Here the trails loop together and pass three different ponds where you might find ducks or geese. The Cedar Grove Trail accurately passes through stands of cedar, and I cajoled my dad and McCrae to stand still for half a second for a quick pic. Theyâ€™re not my most enthusiastic subjects. There are also a few historical features, such as the occasional silo and some old rotting barn that makes for an interesting landmark. The trails at Brumley are generally wide, and Iâ€™m not entirely sure why but they just feel good under my feet: theyâ€™re rolling and friendly itâ€™s fun to pop out onto section of trail along ponds or meadows where you can see a little ways. And since we just happened to be out there bumping into some water sources, I decided to give my new Sawyer filter a try. Iâ€™ve been carrying a Sawyer filter on most of my trail runs and even had to use it one time at Umstead when I ran out of water on a very hot summer day, but I was recently sent a new Sawyer micro filter to try. Both of these filters are easy to use: you fill up the soft plastic bag and just squeeze water through the filter and - ta-da! - fresh water thatâ€™s safe to drink! I filtered the water into Ryderâ€™s bowl, which he appreciated (though he didnâ€™t appreciate it enough to get his picture taken). I liked the new micro filter; itâ€™s shorter and a little fatter than the Sawyer filter Iâ€™ve had for a while, and the filtration rate is definitely faster. Iâ€™ll have to do some more testing to figure out which filter I like better (and why) but for now Iâ€™ll grab either as I head out the door for a long outdoorsy adventure. Get there: You can access Brumley Forest Nature Preserve northern section via New Hope Church Road and Old State Hwy 10 in western Chapel Hill. Distance: Dad and I did about 2.5 miles on the trail. Total hiking in the north section is about 3 miles of trails, while the south section has 11.2 miles of trail. Kid friendly? Yes. Kids will enjoy exploring the ponds. There arenâ€™t many things in the park that cater to kids, but itâ€™s a pretty park with easy trails that kids could explore. Tips: Make sure you navigate to the access point you want. There is a parking lot for the northern section and the southern section. Fortunately, the parking lots are close together so if you get the wrong location the other lot is just down the road. What else can you do in the area? Check out all that UNC and Hillsborough has to offer! Chapel Hill is just down the road and has all the wonderful amenities of a college town, and Hillsborough is a very cute historic town. 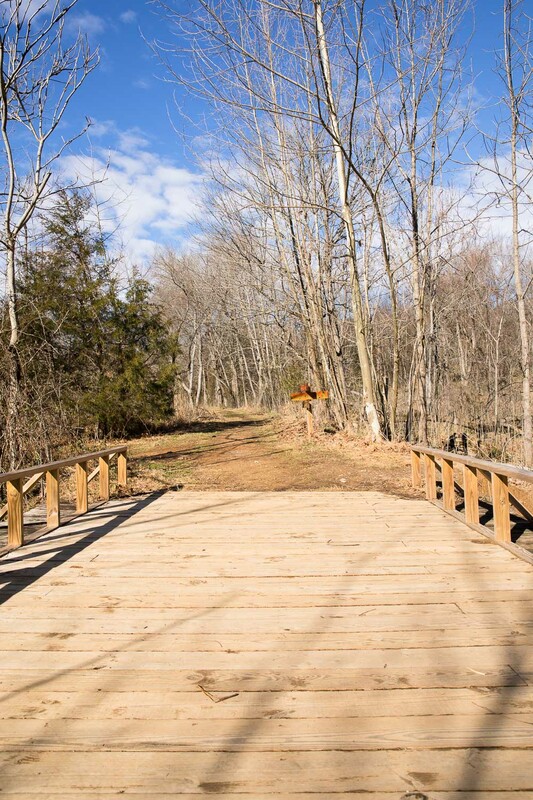 HAVE YOU EVER DONE ANY HIKING OR EXPLORING AT BRUMLEY FOREST? LET ME KNOW IN THE COMMENTS! On Sunday morning when I woke up to go on a Sunday Stroll it was four degrees Fahrenheit outside. Four degrees! I couldn't remember ever witnessing such cold conditions; even the winter break of my freshman year that I spent in Wisconsin racing sled dogs only showed me temperatures as low as 8Â°F. Regardless I had promised my dad that cold or no cold we were hiking that morning at Bass Lake in Holly Springs, so I bundled up with my merino wool long johns, my quilted coat, and my snowboarding jacket and I headed out.